A teen is forced to make a fresh start after witnessing a violent crime—but love and danger find her anyway in this novel from Becca Fitzpatrick, the New York Times bestselling author of the Hush, Hush saga. Stella Gordon’s life is a lie. She does not belong in Thunder Basin, Nebraska. As the star witness in a murder trial against a drug dealer, Stella is now in the Witness Protection Program. The small town locals can never know who she really is. Not even Chet Falconer, the one boy who makes her want to reveal her true self. She knows that telling the truth will only bring violence to this safe haven. Despite how hard Stella tries to stay under the radar, danger is fast-approaching. Criminals have a way of getting rid of witnesses, and Stella may have made the one mistake that could lead the cold-blooded men hunting for her right to her doorstep. Nice romance and character growth. Disclaimer: I received this book from the publisher. I am not paid for this review, and my opinions in this review are mine, and are not effected by the book being free. 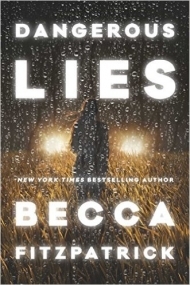 Simon Teen sent me Dangerous Lies in the mail, and I almost didn't pick it up because thrillers and murder aren't usually my thing. But then I read Alyssa's review (Eater of Books) and saw it entailed a hot cowboy and a good romance. Also I then remembered I gave her other thriller 4 stars, so I decided to give it a chance. Stella, the main character is in witness protection because she witnessed her mom's boyfriend and testified against him. Her boyfriend Reed also is in protection, but not in the same place as her. Stella has given up on her mom ever getting sober, so she is with a woman posing as her foster mom, and all of the sudden in a small country town when she is used to a city. She is understandably prickly and upset about the changes. Carmina, the woman she is living with now, is strict and no-nonsense, which Stella doesn't like since she has always had freedom. But I love the bond that eventually forms between them. They open up to one another and there are times when Stella is surprised by how deep her bond with her has become. On the other hand, Stella has been burned by her mom so many times, her mom chosing drugs over her, and the stealing, lies, and neglect. But she has to face her still, and wonder if this rehab might finally take, or if she will be disappointed again. She keeps bumping into older, handsome Chet, from him taking care of the lawn and grounds for Carmina, to running into him when she goes to town to try and contact Reed. They have chemistry right away, but she is in denial because she is still fighting the relocation, and still hoping for things to work out with her and her old boyfriend Reed. But the more time she spends with them, the more they banter, the more Chet is there for her when she needs someone, and she sees his character tested and it proves over and over how good of a guy he is. The ending wasn't what I expected, but it worked for the book, and I like the way that it left the characters with lots of promise and hope for their futures. Bottom Line: Nice romance and character growth. Stella Gordon is living under an assumed name in an inconspicuous small town and she’s not happy. She witnessed a crime and was put in Thunder Basin for her protection until she can testify against the man she saw kill her mother’s drug dealer. She’s missing out on her senior year with her friends, torn away from her boyfriend, and if she’s forced to leave it all behind, no one said she had to be happy or make things easy on the people protecting her. Then she meets Chet and actually starts making some friends. She hates lying to everyone but she can’t tell them the truth. This was a book that I was nervous going into because, from the description, Stella sounded like a character who would get on my nerves enough to possibly hinder my enjoyment of the book. She was hard to like at the beginning but I’m glad that I pushed through because she became a character I did end up liking and she introduced me to a lot of other great characters. Stella started off as pretty self-centered and unappreciative of the people who were putting their lives in danger for her. Yes, her testimony was helping them and they were trained for it but that didn’t mean she had to go out of her way to make things difficult for them. She home life with her drug-addicted mother left her cynical and I could understand her unwillingness to believe rehab would work this time when it never had before. The more she began to open up and try to accept her new life, making connections with the people who were trying to make her feel welcome, the more I liked her. When she turned all that attitude toward something good, like standing up to douchebags, it was great. Carmina, the former cop Stella was placed with for protection, was my favourite character. She was strong and didn’t just roll over and give in to Stella’s bad attitude. She could have let her hide away in her bedroom the whole time but instead she forced Stella to get a job and interact with people. She was stern and they definitely rubbed each other the wrong way at first but it was nice to see their relationship develop into something so caring and sweet. The plot was a bit slow at first. It didn’t start to pick up until Stella started to accept her new life and the last quarter of the book was very action packed and tension filled. There was a lot of mysteries surrounding the plot: Would the bad guys find Stella? What was the past relationship of Carmina and Chet and why were things so weird between them now? Did Trigger actually know Stella from her previous life? So many questions. Some were twists but some were predictable. There were times when I got an old-time Hollywood murder mystery movie vibe from the book and that was something I really enjoyed. Overall, I’m glad I stuck with it no matter how much Stella annoyed me at first because I did end up enjoying it.